Although the first railways started in 1825, it was not until 1830 that the Post Office saw the great advantages of transporting mail bags by train. The railway line between Liverpool and Manchester was opened on 15 September 1830, and this became the first route to carry mail bags. Other routes quickly followed, and volumes of rail mail increased dramatically. The next big step forward was the introduction of sorting carriages on trains in 1838. Although these sorting carriages did not perform the full services available at a post office, they were nevertheless given the title of Travelling Post Offices (usually referred to as TPOs). These TPOs carried Post Office staff, and were able to sort mail in transit as well carrying as the normal sorted bags of mail. You may hear the terms Railway Post Office, Railway Sorting Carriage, Sorting Carriage and Sorting Tender – all of which, by and large, did roughly the same job as TPOs. For this page, we tend to use the terms Railway Office and Railway Post Office, as these were the phrases used in most early TPO Missent handstamps. Don’t be confused by this – such offices were still situated on moving trains! Before we go any further, it is worth mentioning that TPOs were not necessarily named after the railways whose lines they ran on. There was a Great Western T.P.O. (presumably named after the Great Western Railway), but there were also TPOs such as the London & Exeter TPO – whose name indicated where it ran from and to, rather than which companies’ lines it ran on. Ever since the start of the postal system, letters and parcels have occasionally gone astray. Sometimes they were lost and never found again – but that is another story. Sometimes they eventually turned up at the wrong Post Office. Such ‘missent’ mail would be stamped at this ‘wrong’ office with a MISSENT handstamp, and then forwarded directly to the ‘correct’ Post Office (rather than being sent back to the original sending Post Office). One purpose of these MISSENT stamps was to indicate that there was to be no further charge on the letter or parcel for the onward delivery to the ‘correct’ Post Office. It should come as no surprise that, when TPOs were first introduced in 1838, letters and parcels still occasionally went missing. Sometimes, letters or parcels which should have gone to a particular Post Office or Travelling Post Office could get sent in error to a different Travelling Post Office. So, of course, Travelling Post Offices also needed a MISSENT handstamp. Such MISSENT stamps are among the earliest TPO postmarks recorded. The Grand Northern R.P.O – operating under various titles as its route was extended – was the first (and for a while the only) Travelling Post Office in use. The London & Birmingham Railway Office (viz. TPO) began operations on 22 May 1838 as a night mail service between Euston and Denbigh Hall. 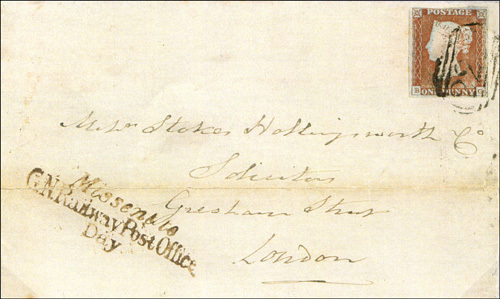 The first TPO postmark ever recorded as being used is a MISSENT London & Birmingham Railway Office stamp (illustrated below) on a letter dated 13 June 1838, sent from Stoney Stratford to Olney. This is the only recorded use of this handstamp. The above handstamp had a short life. 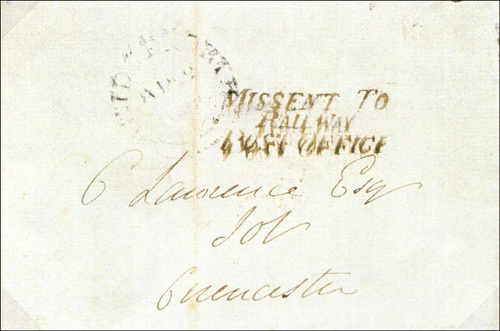 Following line extensions, it was replaced in September 1838 by the following MISSENT handstamp, which is recorded both in black ink and in red ink. This new handstamp had originally been used on an experimental service on the Grand Junction Railway in January 1838, and was subsequently used on the London & Liverpool service which began in 1 October 1838. Bear in mind that we are still talking about the same RPO (TPO) as above, which was the only RPO running at the time. 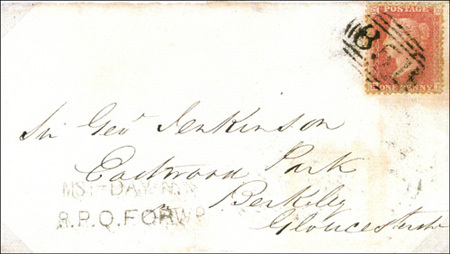 The illustration below shows the only recorded example of this postmark struck in red ink. The red ink version was possibly used on a day mail service. 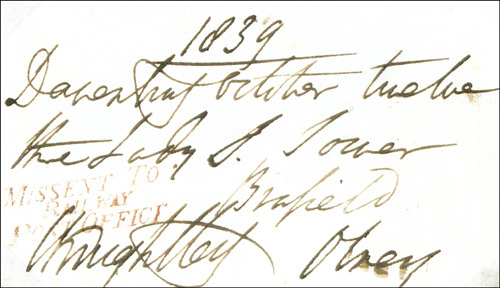 The illustration below shows the same MISSENT postmark (handstamp issued in September 1838) stamped in black ink, used on a letter (from which the postage stamp has unfortunately been removed) sent on 22 April 1843 from Bridgenorth to Cirencester. The black ink version was probably used on the night mail service. A further MISSENT handstamp was issued on 10 November 1938, for use on the GRAND NORTHERN RAILWAY POST OFFICE – the name given to the RPO after its route was extended to Preston on 7 November 1838. Its route was subsequently extended to Lancaster on 8 June 1840. The illustration below shows this handstamp on a letter from Derby date 26 November 1842. Yet another MISSENT handstamp was issued around June 1839, this time for use on the day mail service. 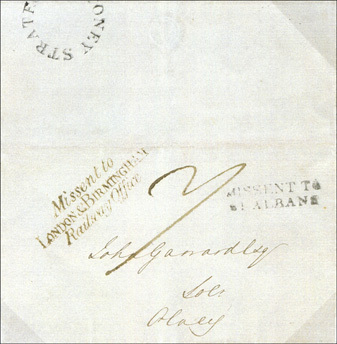 The example below was used on a letter from Coventry dated 18 June 1845. The London & North Western Railway was formed in 1846 by the amalgamation of the London & Birmingham Railway, the Grand Junction Railway and the Manchester & Birmingham Railway. A MISSENT handstamp was issued in February 1856 for the North Western R.P.O. 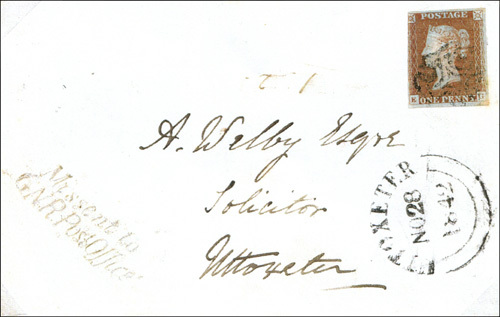 day mail service, and the illustration below shows the only recorded example of the new postmark – used on a letter from Weedon to Berkley and dated 9 April 1857. A MISSENT Night stamp was also issued in September 1856 for the North Western R.P.O. night mail service. 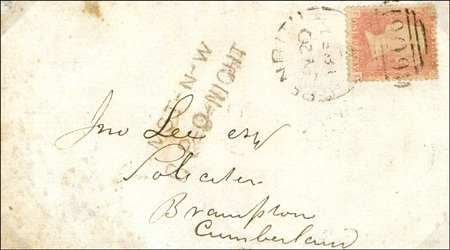 The only recorded example of the night service stamp is on a letter from Penrith (shown below), dated 20 July 1857.